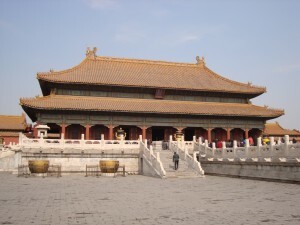 In the old days, Pu Yi told me, there was little love lost between members of the ruling family. 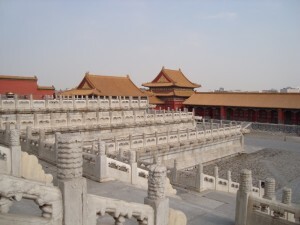 Pu Yi’s uncles, brothers, sisters had to kowtow before him when he was the Emperor. Gautam Buddha sought to banish the afflictions and suffering of the human race by renouncing his throne and seeking enlightenment. 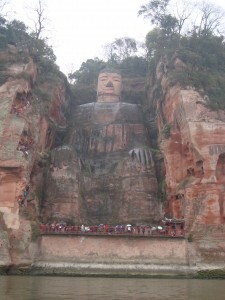 That is why the Lord Buddha (Buddha-deb) does not belong to any one country; he has elevated all of humanity. Pu Yi similarly, by reforming himself and by committing himself to the betterment of the people has ascended beyond the limits of family and has brought honour not just to his dynasty but to all of China. Every person in China now takes pride in the name of Pu Yi. ‘But still I’ll tell you a few things about my life in those dark days,’ [said Pu Yi]. ‘When I was a ruler my movements were confined to the four walls of my palace. I had no opportunity to step outside. My life was tightly bound with rules and prohibitions. I did not have permission to step outside the palace. 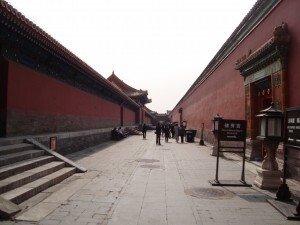 I came to Beijing after regaining my freedom and that was when I walked on the royal thoroughfares for the first time. Let me tell you about a funny incident. 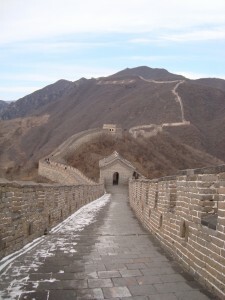 ‘When I came to Beijing everything seemed strange and unfamiliar. I didn’t even know how to ride a motorbus. I didn’t know that tickets were needed for the bus. One day I was waiting at a bus station near the the Bei Hai park with a sister of mine.The bus came and my sister got into it. I saw a lady standing in front of me and asked to her to get in before me. The moment she got in the bus left. I learnt later that the lady was a bus conductor. When I asked her to get in she assumed that I was not traveling on that bus. 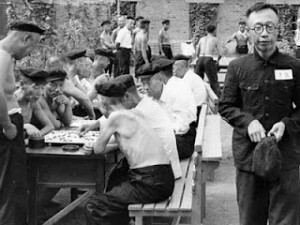 Pu Yi spoke of his days in the camp with intense feeling. In his voice there was not the faintest trace of disaffection or resentment. I said: ‘Pu Yi, you’ve told me about your days as a prisoner. Pu Yi laughed. A strangely serene laugh. He said: ‘From my infancy I was taught – I was the lord of China. That was why I could not accept it when my China was declared a republic. How could I accept that my dynasty would end in my own era? Naturally I wanted a restoration of the monarchy. Japan had a long-standing policy of aggression towards China. That policy and my desire for a restoration resulted in the link with Japan. We both used each other. ‘You want to know about my ‘life as a ruler’. There’s not much to tell. 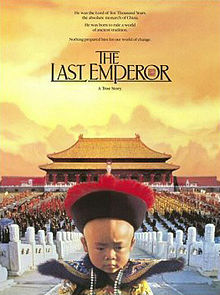 * Arnold C. Brackman, The Last Emperor, 1975. 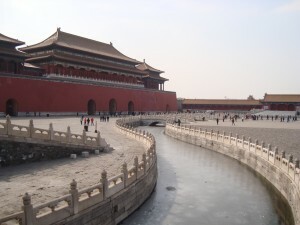 The ‘Red Mowlana’ and the Last Emperor of China: Part 3. ‘The veteran official then explained to us that the Communist Party would be generous with us and would give us every opportunity to examine and reform ourselves. The Party would not look too deeply into the past because there was nothing to be gained from that. He informed us that we would be sent to a war criminals camp in the south-eastern province of Fujien. ‘That was the day when it dawned on me that I would not be shot after all. My relief and gladness was such that I cannot hope to convey their extent. The water of gratitude came into my eyes. That was the day when for the first time in my life, I cried out of gratitude. ‘We went to the camp for war criminals. When I was a monarch no doubt there were hundreds of prisoners in my camps. I have no knowledge of how they were treated. I never saw a jail or a camp for prisoners. But I had a terrifying mental picture of these things. You could say that to a great extent this was like a picture of hell. When I saw a prisoners’ camp for the first (and possibly the last) time in my life it was as a prisoner. All the way from Mukden to Fujien I was quaking with fear and misgiving at the thought of what awaited me. In such a place what would become of the rest of my days! No blankets in the winter, a hard, cold stone floor for a bed, for food, such things that even the dogs of my palace had never touched – whether death would not be better than this unbearable life was a thought that often occurred to me. ‘On arriving in Fujien I saw that there was no connection between the Communist camp and my imaginings. The camp was not intended to punish people. I was the plaything of the country’s enemies! 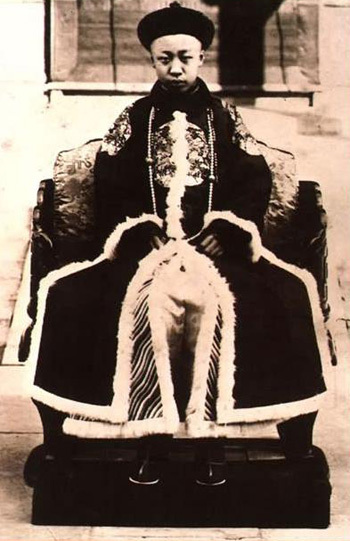 I heard from Pu Yi’s own lips that the crown of China had been placed on his head when he was three years old and that he lost the throne three years later. 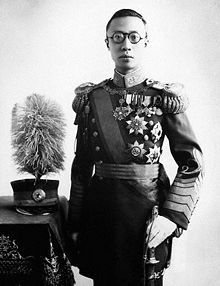 The Japanese kept Pu Yi on the Manchu throne until their defeat in the Second World War, and inflicted terrible oppressions on the people of China, doing everything possible to thwart their aspirations for freedom. 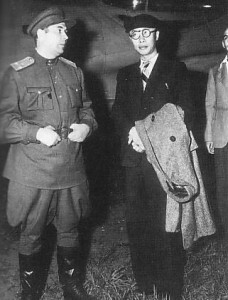 After the Japanese defeat the Soviet Union’s Red Army took the Manchu monarch Pu Yi prisoner and moved him to Russia. 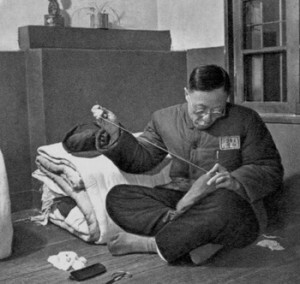 Until the success of China’s revolution in 1949 he remained a prisoner in the Soviet Union. While living there Pu Yi wrote three letters to Stalin. ‘A day came when I really was sent back to China. Our train crossed the Soviet border and stopped at Mukden. At the station I saw that cars had been sent to receive us. Accompanying me on the same train were some erstwhile ministers of the Manchu empire. We were all convinced of our belief – we were to be taken straight to the execution ground. And at once a barrage of bullets would put an end to the illusions of this world (iholila). Our cars came to a halt in front of a big building. Later we learnt that this was an internal security office. We got out of the cars and began to advance towards the building. I was in the middle of the group. Someone said, Pu Yi should be in the lead. I interpreted this to mean that I’d be the first to be shot. I was taken to a room; on entering I saw a table piled with fruit, cakes, cigarettes and so on. I could not understand where I had been brought. After a while some high ranking officials entered the room. Their manner was polite and considerate. One of them remarked, we had traveled a great distance so we must be hungry. We should eat something. At that moment none of us had an appetite. In old China people who were destined for the gallows were always served good food before they were strung up. I thought, they’re probably observing that custom. I couldn’t take it any longer. I said, take us where you want without wasting any time. A perceptive official understood my state of mind and told me that I could see my nephew if I wished; he was an officer in the Chinese liberation Army and was in Mukden at the time. They would set up a meeting. 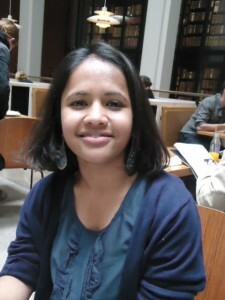 I met Layli Uddin in London, in the British Library. She is of Bangladeshi origin and grew up in England. She has an MPhil in Modern South Asian Studies from Oxford and has also studied at the London School of Economics and Harvard. She is now a PhD student at Royal Holloway, University of London. The title of her thesis is: Mobilising Muslim Subalterns: Bhashani and the political mobilisation of peasantry and lower urban classes, c.1947-71. Layli will soon be traveling to India, Pakistan and Bangladesh in search of new sources and information on Maulana Bhashani. Thus far, much of the academic work on East Pakistan and events leading up to the war of 1971 reflects an elite bias, with its overwhelming focus on the role of Dhaka and the urban intelligentsia. My work argues though that it is the active and forceful participation of the ‘subaltern’ i.e., the peasantry and lower urban classes in various protests, starting from the language protest in the 1950s through to the industrial and rural ‘gherao’ protests in the 1960s and the freedom movement of the 1970s which transformed the nature and dynamism of these resistances and presented a real threat to the a governing authority in West Pakistan. It therefore thrusts, and rather deliberately too, the neglected and marginalised subaltern in the limelight and looks at how they envisaged this ‘land of eternal Eid’ and why that rather Arcadian paradise soon disintegrated into a land stalked by angry and disenchanted peasants and lower urban classes. I look at the different forms and practices of subaltern resistance and attempt to excavate the consciousness of the peasant through the official records as well as other mediums such as folk songs, rhymes, ballads, anecdotes and literature of that period. Maulana Bhashani plays a central figure in my work on restoring the creative agency of the ‘subaltern’ in the making and unmaking of Pakistan between 1947-71. 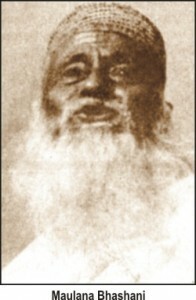 Maulana Bhashani, who had made his mark as an unusually powerful pir, radical peasant leader and politician in colonial Assam went onto become one of the main dissenting figures to the rule of West Pakistan authority. American officials described him as ‘East Pakistan rabble rouser par excellence’, the Jamaat-e-Islami as ‘kaafir’ and the East Bengalis as ‘Majlum Jononeta’ (leader of the oppressed). My work seeks to understand the charismatic authority of Maulana Bhashani and his relationship with the peasantry and lower urban classes in East Pakistan. It is a charisma that befuddled many; the US Consul General, Archer Blood, when paying a visit to Bhashani was left bemused by the popularity of the bare-footed 88 year-old man, clad in a dirty undershirt and lungi who greeted him. My work looks at Bhashani’s network and spheres of influence, ideas on Islamic socialism and his strategies of political mobilisation. 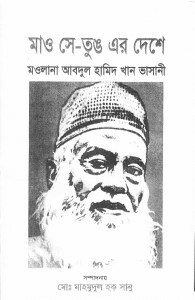 It is difficult to summarise the enigma that is Maulana Bhashani and what a complex and exciting figure he presents for research – how did this Deobandi-trained maulana come to defend Tagore’s music and become the leader of Marxist revolutionaries in East Pakistan? Why did the founding father, Mujib, fear being upstaged by the septaguenarian Bhashani? How did Bhashani’s Islamic socialism ‘fit’ with the radical demands made by peasantry and lower urban classes in East Pakistan? My work has already thrown up some fascinating and tantalising information, which I hope to explore as research progresses – Bhashani’s relationship with radical ‘ulama in colonial India; his meetings and encounters with the grandees of the political left in Europe such as Attlee, Bevan, Bertrand Russell, Neruda, Hikmet and Ehrenburg in Europe and his other trips to Egypt, Cuba and China in the ‘50s and ‘60s. Admittedly, as a first year PhD student, this is all striking me as rather too ambitious, with perhaps all the pretensions of a Howard Zinn impostor, but nonetheless exciting, foray into a rather neglected yet critical part of Bangladeshi history. My conversation with Layli got off to a good start because it so happens that I have actually met Maulana Bhashani. It happened when I was very young and I have no memory of the meeting: I know of it only because my father liked to tell the story. 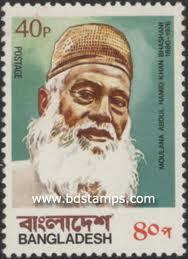 Apparently, when I was a little boy, the Maulana saw me at a gathering, somewhere in Dhaka, and hoisted me on his shoulder. When I recounted this to Layli she was not at all surprised. Maulana Bhashani had many unlikely encounters, she said – including one with Pu Yi, the last Emperor of China. The Last Emperor and Maulana Bhashani? Had they really met? How could she possibly know? Through the Maulana’s account of it, said Layli. He had written about the encounter in his book, Mao-Tse Tung-er Deshe (In Mao Tse-tung’s Country, by Maulana Abdul Hamid Khan Bhashani). Quite apart from the inherent interest of a meeting between the last incumbent of the Qing dynasty and this leftist-Deobandi Maulana, I was also taken by the sudden shrinkage in the degrees of separation between myself and the last Emperor of China. I asked Layli if I could read the chapter and she was kind enough to provide me with a copy. I was not disappointed: the Maulana’s account of the meeting is strangely compelling, and since it has never been published in English I decided to translate a few excerpts myself. These will appear on this site as a multi-part series. 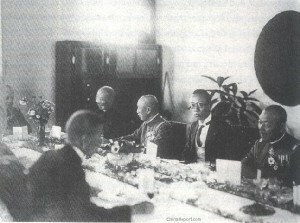 Pu Yi conspired against the people of China with Japanese and Western imperialists. And now the same Pu Yi has committed himself to the building of a socialist society. What sort of man is this Pu Yi? 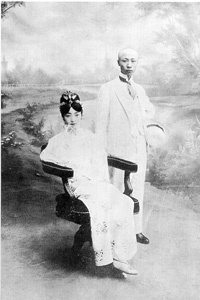 …At one time Pu Yi was training to be a curator in a Chinese botanical garden. But in 1961 a commission was specially created to write a new history of China and he was transferred to an office of the People’s Consultative Conference to help with the research. That was where I met Pu Yi. He is a slim, inoffensive-looking man of middling stature. I couldn’t find any resemblance between him and the Pu Yi of my imagination. His bright, smiling face and his shining eyes betrayed no signs of the sly conspirator. I was amazed – could this be the same Pu Yi who helped the Japanese against Chinese revolutionaries? Who wanted to keep China prone while he floated high on the froth of luxury? I could not quite believe it. How old could he be? Thirty, or at the most thirty-five? But Pu Yi corrected me himself, saying that he was actually 57 years old. He looked very young for his age. I entered his office at four in the afternoon and when I left it was eight thirty.